Recently I received an old reprint of a painting. At first it was just typical 1950's cheap wall art to me, but since having it on my wall I've begun to like it and now I'm curious where this scene may have been painted. The building on the left appears to have church-like windows, though the building has no steeple. All the buildings visible have bright red roofs and are on the shores of a lake with very steep forested hills around them. The signature on that painting suggests it was painted by Robert Wood, which means it's almost certainly set in the US. 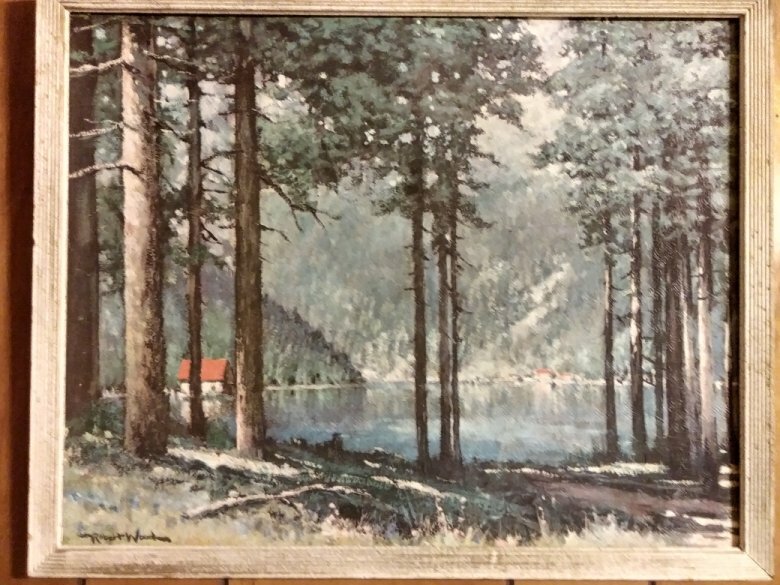 In fact, a little Google searching shows this painting goes by the name "Pine Grove Lake". I can't tell you, however, where this actually is in the US, if it is't some imaginary scene. I think you're more likely to find that out on a site related to art rather than travel. Not the answer you're looking for? Browse other questions tagged identify-this lakes or ask your own question.